DogmaDrift | Indeed, if a little knowledge is dangerous, where is the man who has so much as to be out of danger? Efforts to extend suffrage to women throughout the 19th century in several English-speaking countries began bearing fruit around the turn of the 20th century. New Zealand granted women the vote in 1893, Australia nine years later; the 19th Amendment passed in both the U.S. House and Senate in 1919, following several individual state initiatives. Numerous societies were formed and conventions held to that end as momentum grew, meeting various successes and defeats, including both the resistance of those, mostly men, determined to maintain the status quo, as well as the support of other prominent men such as John Stuart Mill. Efforts were mostly peaceful. In 1897, British women organized into these advocacy groups, known as ‘suffragists,’ coalesced to form the National Union of Women’s Suffrage Societies (NUWSS). 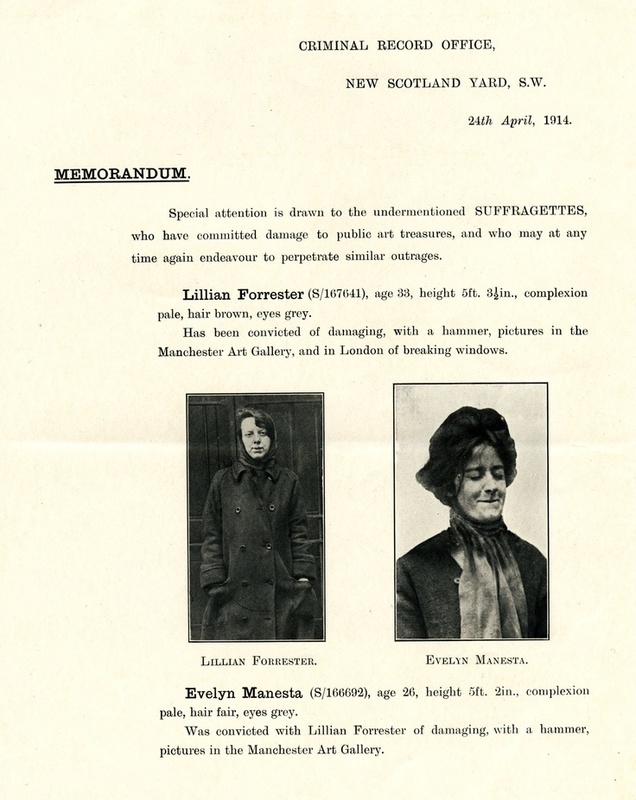 The government’s failure to acknowledge their activities, however, led to radicalization on the part of certain women: the movement arrived at a turning point in 1903, when Emmeline Pankhurst and her daughters Christabel and Sylvia formed the Women’s Social and Political Union (WSPU), vowing to pursue more aggressive measures to force the issue. 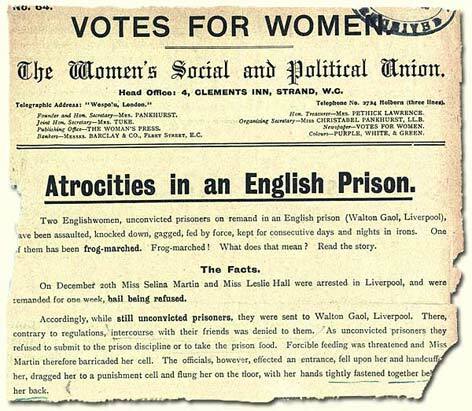 The Daily Mail first referred to them as ‘suffragettes‘ in 1906, coining the term to differentiate them from their milder and less militant counterparts, the ‘suffragists.’ Their motto, “Deeds not words,” indicated their intention to engage in direct actions of civil disobedience, including vocal protests, disruption of political meetings, women chaining themselves to railings and tax resistance, later evolving into the destruction of property, arson and the occasional smashing of windows (“Phyllis North, whom I identified as Joyce Lock, otherwise Olive Wharry … unlawfully and maliciously did commit damages upon the windows of the Criccieth Post office, the property of H.M. The King, doing damage to the amount of £11-8-0…”)—the ensuing arrests garnering more attention to their cause. 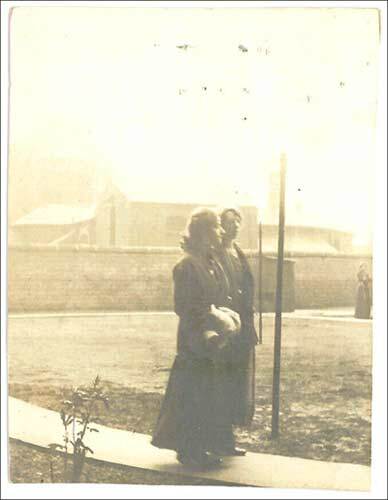 The relation between Scotland Yard and these women—a game of “cat and mouse” between the police and these political subversives, considered to be a threat to the political order—was significant for several reasons, not the least of which was giving rise to an early instance of state photographic surveillance (covert photography), as reported by the BBC’s Dominic Casciani. 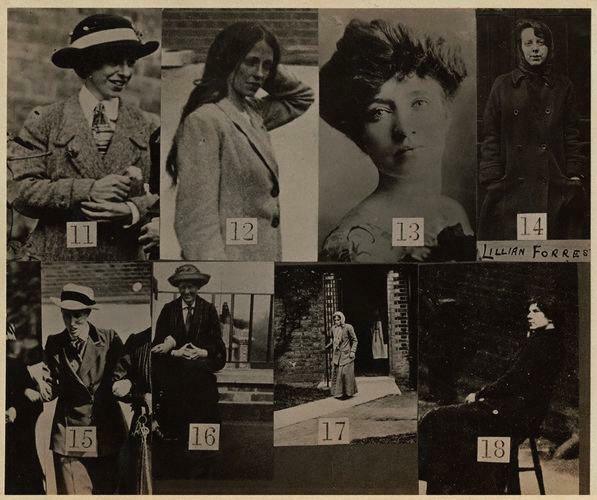 Several Suffragettes also engaged in hunger strikes, continuing the civil disobedience while inside prison, adding to an atmosphere of “[i]ndignation and passionate protest,” during which some underwent repeated force-feedings. In 1871, prisons had begun photographing inmates for identification purposes, and this relatively young technology was put to use for surreptitiously monitoring the women. Scotland Yard—which bought its first camera for the occasion—employed a Mr. A. Barrett, who, unknown to them, “sat quietly in a van, snapping away as the women walked around Holloway Prison’s yards.” At the same time, detectives compiled ID lists of suspects to help suppress the more dramatic and militant actions. 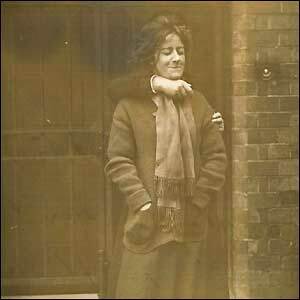 Suffragettes refused to cooperate in other ways, including resisting attempts to have them pose for photography sessions, requiring coercion—and trickery—on the part of authorities. In Manchester Prison, a guard was needed to restrain known “window-smasher” Evelyn Manesta from behind for the camera, resulting in the awkward image of a woman standing with a man’s arm draped around her neck. Upon official instructions, the problematic appendage was then artfully erased from the image by the photographer, the sanitized version duly reproduced for circulation. Update (March 11): Related to questions of consciousness, a recent article from New Scientist (reprinted in the Washington Post) addresses the question of whether or not certain invertebrates feel pain in some way comparable to humans, and consequently if they are capable of suffering. Researcher and professor Robert Elwood emphasizes that direct comparisons with humans are not always appropriate; denying that crabs, for instance, feel pain because they don’t have the same biology as us “is like denying they can see because they don’t have a visual cortex.” Again, this type of reasoning would depend on narrowly defining these capacities, such as seeing, as seeing like a human—that is, there would be no other possible way of seeing, “seeing” being a uniquely human property or behavior. The article also makes the distinction between learned behaviors—arising as a result of experiencing pain, remembering it and acting in order to avoid it—and simple reflexes, which may be unconscious and automatic responses to stimuli. Experiments with crustaceans revealed “prolonged and complicated behavior, which clearly involves the central nervous system,” as opposed to insects, suggesting that insects have had no evolutionary need or constraints to experience pain in the same way. Importantly, the article qualifies suffering as a subjective experience, and therefore “private to each individual, leaving us only with educated guesses” as to how it is actually lived—the implications being that there is ultimately no way of fully understanding how another organism suffers, except by way of observation and experimentation. One difficulty arising from this, it seems to me, is that certain results/behaviors can be wrongly interpreted as “learned,” or conscious, when they are in fact reflexive, and vice versa. The institutions of U.S. democracy are equated with the ideas and principles behind them. Thus, for example, the idea of a representative government has become identified with a three-part government consisting of executive, legislative, and judiciary branches with the former two elective and the third not. The U.S. version of democracy has come to be thought of by Americans not merely as one of many possible versions, but the very essence of democracy itself. As a result, when the United States sets about to try to promote democracy in a foreign country, it tends not to think about how the general ideas and principles of democracy might take form in that society but to assume that the other country should devote itself to establishing the institutional configuration the United States associates with democracy. 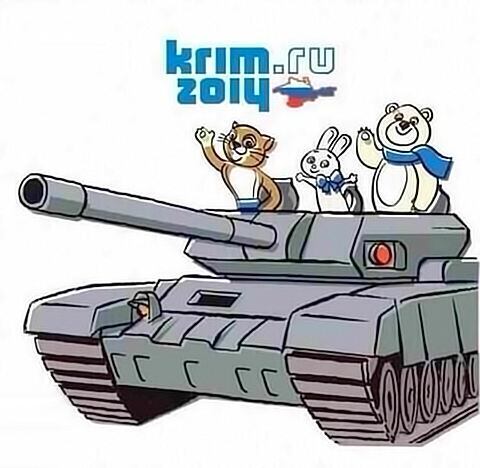 As with most conflicts, we have been subjected to a barrage of propaganda from both sides, some announcing a reemergence of the Cold War, some networks cheering the feisty freedom fighters of Euromaidan, slinging their rocks at the Russian Goliath, while Kremlin outlets like RT (Russia Today) would have you believe that President Putin just wants everybody to get along, as he orders his Black Sea fleet at Sevastopol to join in the humanitarian intervention underway in Crimea, thereby protecting defenseless ethnic Russians from the hordes of raving brutes roaming the streets… The usual jingoist loudmouths and foreign policy “intellectuals,” who have a talent for not noticing when their own country commits some awful atrocity, have suddenly discovered the evils of military intervention, this time the wrong flavor; severe, doctrinaire Marxists have uncovered the imperialist, neoliberal plot fomenting revolt to usher in another phony “color revolution.” It is true that the recent uprising has had its share of unsavory characters (as well as pseudo-fascist groups), if we can believe the reports, but it is typically the most aggressive and violent elements who tend to seize opportunities like this—and on whom television cameras and photographers tend to focus their attention—to the detriment of the rest of the population, which may have legitimate grievances. It is also true that anyone who orders troops into an area should have to explain himself. We were also told that funds from the U.S., funneled through Non-Governmental Organizations (NGOs) such as USAID and the National Endowment for Democracy (NED), may have contributed to the political crisis by supporting various political opposition groups and front organisations, as well as promoting the usual teams of “experts” and businessmen who are “developing a vision” for Ukraine, one slogan at a time. This would be nothing new, of course, as the U.S. has since the 1950s worked to extend its influence abroad by funding and promoting various political and cultural activities, propagating values and ideas which further its interests, both overtly and covertly. Shaping perceptions through propaganda has been another component of that broader effort, Voice of America (VOA) and Radio Free Europe/Radio Liberty (RFE/RL) being obvious examples; RFE/RL is broadcast presently from its headquarters in Prague to 21 countries in 28 languages, including 14 affiliates in Iraq, 17 in Afghanistan, 55 in Serbia, 43 in Kosovo and 16 in Ukraine. It would indeed be surprising if the U.S. weren’t trying to influence the politics of a country like Ukraine, as such has been the norm throughout the post-WWII era. 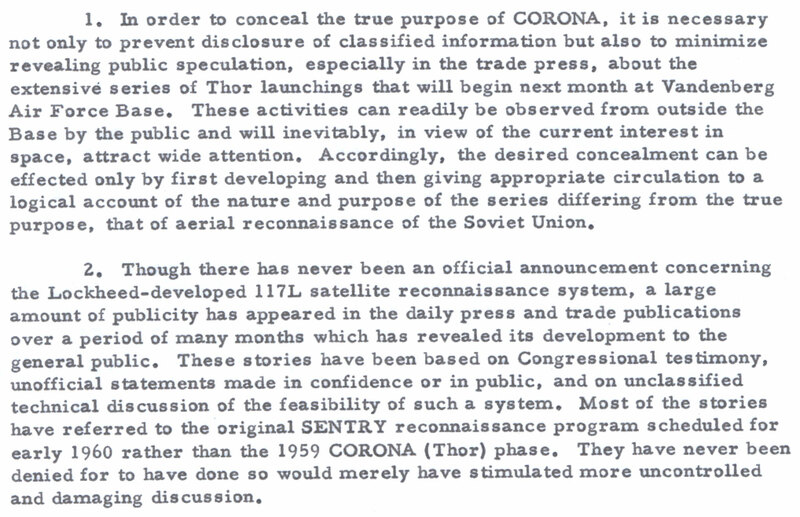 As the U.S. government wished to conduct certain anti-Communist activities covertly, these radios initially operated as projects of ostensibly independent committees—cover organisations—to conceal the extent of government involvement. 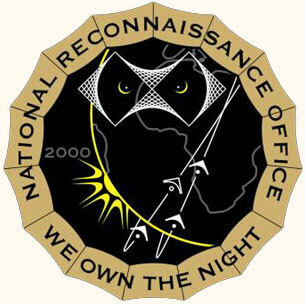 RFE was initially a project of the National Committee for a Free Europe (NCFE—later the Free Europe Committee), a corporation established in 1949, mostly funded and directed by the Office of Policy Coordination (OPC) within the Central Intelligence Agency (CIA); RL the vehicle of the non-profit organization American Committee for Liberation of the Peoples of Russia, Inc. (AMCOMLIB—later the Radio Liberty Committee), a “front” based in New York City used by the CIA as part of its Project QKACTIVE [PDF]. State Department Policy Planning Staff Director George Kennan drafted a 30 April 1948 memo [PDF] to the National Security Council outlining his ideas for establishing a policy for what he called “organized political warfare.” Political warfare took two possible forms—overt and covert. Viewing it as “the logical application of Clausewitz’s doctrine in time of peace,” he broadly defined it as “the employment of all the means at a nation’s command, short of war, to achieve its national objectives,” entailing “such overt actions as political alliances, economic measures (as ERP), and ‘white’ propaganda to such covert operations as clandestine support of ‘friendly’ foreign elements, ‘black’ psychological warfare and even encouragement of underground resistance in hostile states.” Kennan claimed that U.S. planners had been “handicapped” by the notion of “a basic difference between peace and war,” a conception of war as “a sort of sporting context outside of all political context,” rather than recognizing a broader struggle which continued both “in and out of war.” Several projects were proposed to support the activities of Soviet émigrés, among which: the creation of a public organization to sponsor selected refugee committees and “outstanding political refugees,” particularly “enabling selected refugee leaders to keep alive as public figures with access to printing presses and microphones”—these leaders would “act as foci of national hope and revive a sense of purpose among political refugees from the Soviet World,” provide inspiration for “continuing popular resistance,” and “serve as a potential nucleus for all-out liberation movements in the event of war”; sustaining underground movements behind the “Iron Curtain” through “remote and deeply concealed official control of clandestine operations,” with funds channeled through private organizations acting as intermediaries; support for indigenous anti-Communist elements within Soviet countries, again though private intermediaries; and preventive “direct action” in non-Soviet countries, such as anti-sabotage activities. Similarly, Soviet expert Robert F. Kelley recognized that Russian political refugees represented “a tremendous weapon of political warfare” against the Soviet Union in a May 1949 memo [PDF]. He recommended the formation of a central organization to coordinate anti-Communist activities, provided with clandestine radio facilities to broadcast programs into Soviet countries. An October 1949 memo [PDF] outlines the relationship between the CIA/OPC and the NCFE—the purpose of the NCFE being to offer support to the “political and intellectual leaders” who have come to the U.S. “seeking the freedom denied them in their own lands,” with the OPC providing direct policy guidance and funding. These leaders were to be aided in their efforts “to keep alive among their fellow citizens in Europe the ideals of individual and national freedom,” notably through radio, press and other media, as well as establishing a network with other “like-minded European leaders” in the U.S. and abroad. The United States condemns the Russian Federation’s invasion and occupation of Ukrainian territory, and its violation of Ukrainian sovereignty and territorial integrity in full contravention of Russia’s obligations under the UN Charter, the Helsinki Final Act, its 1997 military basing agreement with Ukraine, and the 1994 Budapest Memorandum. This action is a threat to the peace and security of Ukraine, and the wider region. Update (March 5): To substantiate claims of U.S. intervention in Ukraine since WWII, as but a small sampling, a 2011 study by professors Richard Breitman and Norman J. W. Goda, Hitler’s Shadow, contains some information on CIA and British MI6 operations involving Ukraine during the post-war era. Under the direction of the National Archives, the Nazi War Crimes and Japanese Imperial Government Records Interagency Working Group (IWG), established by the 1998 Nazi War Crimes Disclosure Act [P.L. 105-246], has declassified around 8 million pages of documents since 1999; these records, particularly from the CIA and the Army Intelligence Command, provided source material for Breitman and Goda’s excellent study [PDF]. Chapter five concentrates on the Allied cooperation with the Organization of Ukrainian Nationalists (OUN) under Stephen Bandera, founded in 1929, and exiled proponents of the underground government, Foreign Representation of the Supreme Ukrainian Liberation Council (ZP/UHVR). Initially throwing in their lot with the Germans, OUN leaders were housed in occupied Krakow in 1939. Bandera’s deputy Jaroslav Stetsko trained with the Gestapo; Ukrainian battalions under German command moved into East Galacia (western Ukraine)—where 12,000 Jews were murdered in pogroms at the start of the war—and auxiliary police units engaged in “anti-partisan” operations, often targeting Jews. Ukrainians from the auxiliary units and members of the OUN/B joined the ranks of the Ukrainian Insurgent Army (UPA), a guerrilla organization engaging in terror operations, formed to engage “all political and ethnic enemies including Germans and Soviets.” Although its leaders were imprisoned in 1941 by the Germans and eventually held in the Sachsenhausen concentration camp because of their militant nationalist tendencies—threatening the Nazis, who wished to consolidate their control over Ukraine—the OUN/B (Bandera) wing of the OUN was an openly fascist organization whose ideology merged with that of the Nazis: the territory was to be ethnically cleansed of “impure” (non-Ukrainian) elements in the drive for national independence. Stetsko lamented from Lwów in 1941 the “undeniably harmful and hostile role of the Jews, who are helping Moscow to enslave Ukraine,” supporting “the destruction of the Jews and the expedience of bringing German methods of exterminating Jewry to Ukraine…”; historian Yehuda Bauer wrote that Bandera loyalists “killed all the Jews they could find”; OUN/B leader Mykola Lebed proposed in 1943 to “cleanse the entire revolutionary territory of the Polish population,” which they did, killing as many as 10,000 Poles in a single day in 1943; according to Moshe Maltz, Bandera loyalists were “literally hacking Poles to pieces,” whose bodies could be seen “with wires around their necks, floating down the river Bug.” Asserting his authority over the Ukrainian émigré community after his release from Sachsenhausen, Bandera formed the Foreign Section OUN (ZCh/OUN) in 1946, a group which routinely engaged in terror and intimidation against its political opponents; plans envisaged a dictatorship formed in exile which would establish control over Ukraine, once liberated. Bandera loyalists quickly developed an effective network of recruiting agents among the postwar displaced person camps of the American, British and French zones. Owing to their generally anti-Communist stance, U.S. Army Counterintelligence Corps (CIC) agents used them to identify Soviet spies, who had penetrated UPA refugee groups. The UPA foresaw “an end to communism within the very near future,” hoping to eventually “fight either as front shock troops or gain in their old capacity, as guerilla fighters behind the Russian lines”; Bandersts similarly portrayed themselves as the “heroic Ukrainian resistance against the Nazis and the Communists,” a struggle “misrepresented and maligned” by “Moscow propaganda.” Although the CIA discouraged collaboration with Bandera and his organization, considering him “a political intransigent of great personal ambition” and “politically unacceptable to the US Government,” MI6 saw them as potentially useful for “engaging in clandestine operations in the Soviet Union other than those of a purely intelligence-gathering character,” and assisted in inserting them into western Ukraine to gather intelligence. He was seen as “a professional underground worker with a terrorist background and ruthless notions about the rules of the game. … No better and no worse than others of his kind…” West German intelligence (BND) similarly reported that it was receiving “good [foreign intelligence] reports on the Soviet Ukraine” through its collaboration with him, until his assassination by a Soviet agent in 1959. Beginning in 1953 AERODYNAMIC began to operate through a Ukrainian study group under Lebed’s leadership in New York under CIA auspices, which collected Ukrainian literature and history and produced Ukrainian nationalist newspapers, bulletins, radio programming, and books for distribution in the Ukraine. In 1956 this group was formally incorporated as the non-profit Prolog Research and Publishing Association. It allowed the CIA to funnel funds as ostensible private donations without taxable footprints. To avoid nosey New York State authorities, the CIA turned Prolog into a for-profit enterprise called Prolog Research Corporation, which ostensibly received private contracts. Under Hrinioch, Prolog maintained a Munich office named the Ukrainische-Gesellschaft für Auslandsstudien, EV. Most publications were created here. The Hrinioch-Lebed organization still existed, but its activities ran entirely through Prolog. Prolog recruited and paid Ukrainian émigré writers who were generally unaware that they worked in a CIA-controlled operation. Only the six top members of the ZP/UHVR were witting agents. Beginning in 1955, leaflets were dropped over the Ukraine by air and radio broadcasts titled Nova Ukraina were aired in Athens for Ukrainian consumption. These activities gave way to systematic mailing campaigns to Ukraine through Ukrainian contacts in Poland and émigré contacts in Argentina, Australia, Canada, Spain, Sweden, and elsewhere. The newspaper Suchasna Ukrainia (Ukraine Today), information bulletins, a Ukrainian language journal for intellectuals called Suchasnist (The Present), and other publications were sent to libraries, cultural institutions, administrative offices and private individuals in Ukraine. These activities encouraged Ukrainian nationalism, strengthened Ukrainian resistance, and provided an alternative to Soviet media. Prolog’s leaders and agents debriefed travelers on their return and shared information with the CIA. In 1966 alone Prolog personnel had contacts with 227 Soviet citizens. Beginning in 1960 Prolog also employed a CIA-trained Ukrainian spotter named Anatol Kaminsky. He created a net of informants in Europe and the United States made up of Ukrainian émigrés and other Europeans travelling to Ukraine who spoke with Soviet Ukrainians in the USSR or with Soviet Ukrainians travelling in the West. By 1966 Kaminsiky was Prolog’s chief operations officer, while Lebed provided overall management. Lebed retired in 1975 but remained an adviser and consultant to Prolog and the ZP/UHVR. Roman Kupchinsky, a Ukrainian journalist who was a one-year-old when the war ended, became Prolog’s chief in 1978. In the 1980s AERODYNAMIC’s name was changed to QRDYNAMIC and in the 1980s PDDYNAMIC and then QRPLUMB. In 1977 President Carter’s National Security Adviser Zbigniew Brzezinski helped to expand the program owing to what he called its “impressive dividends” and the “impact on specific audiences in the target area.” In the 1980s Prolog expanded its operations to reach other Soviet nationalities, and in a supreme irony, these included dissident Soviet Jews. With the USSR teetering on the brink of collapse in 1990, QRPLUMB was terminated with a final payout of $1.75 million. Prolog could continue its activities, but it was on its own financially. Over the years, I’ve grown to love and appreciate flamenco. I had the pleasure of working the sound during a concert by Juan Carmona in Aix-en-Provence years ago, and was impressed by the levels of musicianship, technique, rigor, emotion and physicality which could all coincide in one music, as something rare. Paco helped develop what is known as the “New Flamenco,” incorporating sophisticated harmonic colors from jazz and other musics, while maintaining structures resulting from a long-established tradition—as well as popularizing the cajón from South America, an instrument whose timbre marries perfectly with the acoustic guitar, as if it had always been a part of flamenco. But then, that’s normal; the work of a master, like Paco, or J.S. Bach or Miles Davis, has an inevitable quality to it, a tendency to present itself as the most natural—or the only—way of going about it, so that doing it any other way seems almost inconceivable. There are people who find flamenco too harmonically uniform, or dislike aspects of a certain stereotypical or clichéd idea of it, but these types of complaints often come from those who are simply not listening well enough. Although it has a life of its own, as an oral tradition, flamenco can be more broadly situated among the different styles of music—fusions with local cultures, really—created by communities (in Spain, gitanos) resulting from the voyages of the various Roma, or Romani (still colloquially known by the inaccurate label [or exonym] “Gypsies”) throughout Europe and North Africa—popularized in recent decades by filmmakers such as Tony Gatlif. Like most orally transmitted music, what it may lack in some qualities it compensates for elsewhere, and the various complexities and subtleties can only be noticed when one becomes familiar with it. But this is not something to discuss as much as it is to be heard. As the Country, is large enough to contain us all; and as we are disposed to be kind to them and to partake of their Trade, we will from these considerations and from motives of Compn, draw a veil over what is past and establish a boundary line between them and us beyond which we will endeavor to restrain our People from Hunting or Settling, and within which they shall not come, but for the purposes of Trading, Treating, or other business unexceptionable in its nature. At first view, it may seem a little extraneous, when I am called upon to give an opinion upon the terms of a Peace proper to be made with the Indians, that I should go into the formation of New States; but the Settlemt of the Western Country and making a Peace with the Indians are so analogous that there can be no definition of the one without involving considerations of the other. for I repeat it, again, and I am clear in my opinion, that policy and oeconomy point very strongly to the expediency of being upon good terms with the Indians, and the propriety of purchasing their Lands in preference to attempting to drive them by force of arms out of their Country; which as we have already experienced is like driving the Wild Beasts of the Forest which will return us soon as the pursuit is at an end and fall perhaps on those that are left there; when the gradual extension of our Settlements will as certainly cause the Savage as the Wolf to retire; both being beasts of prey tho’ they differ in shape. …that nation, consisting now of about 2000. warriors, & the Creeks of about 3000. are far advanced in civilisation. they have good Cabins, inclosed fields, large herds of cattle & hogs, spin & weave their own clothes of cotton, have smiths & other of the most necessary tradesmen, write & read, are on the increase in numbers, & a branch of the Cherokees is now instituting a regular representative government. some other tribes were advancing in the same line. on those who have made any progress, English seductions will have no effect. but the backward will yeild, & be thrown further back. these will relapse into barbarism & misery, lose numbers by war & want, and we shall be obliged to drive them, with the beasts of the forest into the Stony mountains. Although originality is certainly a virtue, I see a problem with the fact that artists are often accused of “ripping off” other artists by copying and incorporating portions of their songs in their own work. Not only does popular music—and music in general—depend largely on choosing between elements of an already existing repertoire of themes, techniques and ideas, it could be argued that part of the artistry is the ability to cleverly incorporate and rearrange these elements in new ways to create something novel and uniquely personal. After all, if one was required to reinvent the wheel with each song, or book, there would be very few songs to listen to, or books to read, and the distinction between being influenced by someone and outright copying them is not necessarily so clear—the point at which an idea is modified so much that it becomes another distinct idea is not so clear either. If ideas can be “stolen,” then most of us are thieves on some level. Furthermore, music, as one human activity among many, like language, is subject to inherent limitations resulting from our inborn capacities (genetic makeup), and so we should expect to see what are basically unlimited variations on a finite set of abilities—we should not expect humans, in other words, to begin producing “non-human” music. Even though we all have certain inherent capacities which are more or less the same, no one creates in a vacuum, and most human activities are a result of a collaboration, whether direct or indirect. In fact, it could even be said that this blog post itself is a remix of an idea which inspired me in the first place to write on the topic (of course, this apparent similarity is merely a coincidence). For example, according to the presentation on R.L. Burnside’s 1969 release on Arhoolie (recorded in 1967), his track “Skinny Woman” is based on Yank Rachell’s 1934 recording of “Gravel Road Woman.” In what might be its earliest recorded form, we can locate a version of “Gravel Road Woman” interpreted by Yank Rachell & Dan Smith. 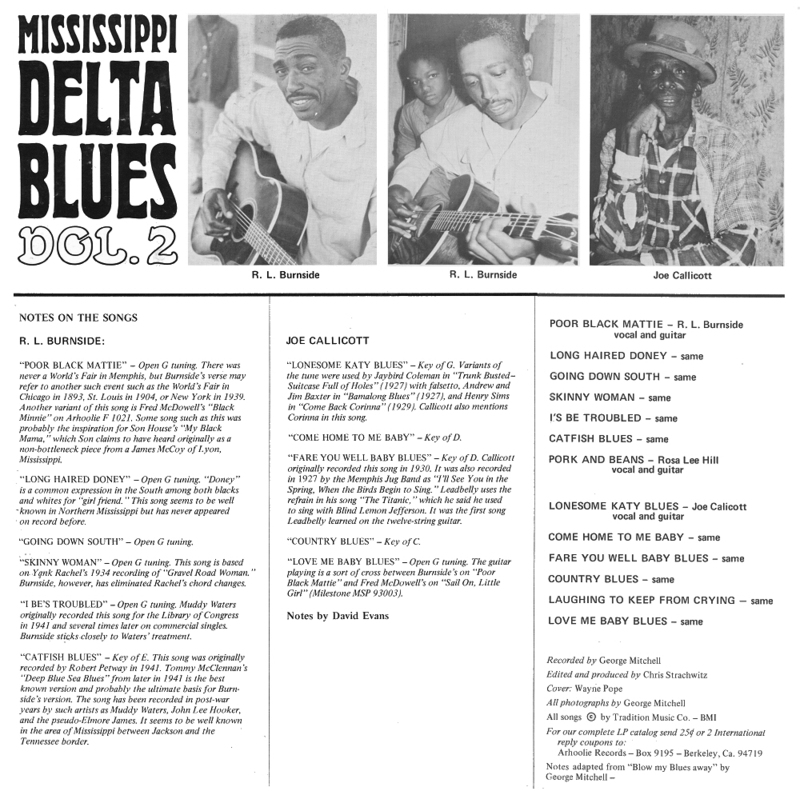 Musically, they are similar in the way that many Delta Blues songs are similar, but not recognizably so, and Burnside simply seems to have used the idea and lyrics of the song as an inspiration for his own creation, most notably the repetitive melodic motif in the bass. Burnside’s song was later covered, with different lyrics, by the Black Keys under the title “Busted,” released in 2002. Moving to Scottish musician Bert Jansch, who was himself influenced by American folk and blues singers, “Blackwater Side,” itself based on the traditional folk song “Down by Blackwaterside,” was released in 1966, three years before Burnside’s album—the song incorporates a motif very similar to Burnside’s “Skinny Woman” but was released before it, raising the question of who exactly influenced whom, if at all. Led Zeppelin, whose tendency to lift the songs of bluesmen/women for their own purposes is well-documented, released their—or rather, Jimmy Page’s—version of the song in 1969 under the title “Black Mountain Side,” thereby barely concealing the origins of the piece. This all brings us to four observations of interest: 1) Although a song may be “based on” another, it can sound rather different, 2) Unoriginal ideas may still result in good music, 3) When copying, it is not the lack of originality which is insulting, as much as it is the failure to acknowledge where one’s ideas come from, and 4) Even though one may not even be aware of the provenance of one’s ideas, they may still be virtual copies of other ideas. In our work and planning and discussions, our main principle is that separation between peoples, war between peoples, is not a solution for any of the problems that divide them […] I, for one, am full of optimism, despite the darkening sky and the seemingly hopeless situation, for the time being, that encloses us all. No one, of course, is conscious of his own ideology, any more than he can smell his own breath. And your way, is it really your way? […] What, moreover, can you call your own? The house you live in, the food you swallow, the clothes you wear — you neither built the house nor raised the food nor made the clothes. […] The same goes for your ideas. You moved into them ready-made. Nothing annoys forces of authority more than trying to bow out of the disciplinary game entirely and saying that we could just do things on our own. Direct action is a matter of acting as if you were already free. Real power begins where secrecy begins. …what I do know is that the world is not governed by good sense, but by multinationals. Hiroshima | Hiroshima – Was it Necessary? Birdsong in Messiaen's "Oiseaux exotiques"
9/11 | Hunt the Boeing! The Friedman Files | Mr. Friedman, could I ask you a question? Video | Everything Is Terrible!